Naples is the largest city in southern Italy and a popular travel destination. Known as the home of pizza, it sits cradled in the shadow of Europe's most famous volcano, Mount Vesuvius, which destroyed the cities of Pompeii and Herculaneum in 79 AD. With a sunny climate and the Bay of Naples - one of the world's best views - on its doorstep, it's no wonder that the city also contains some great beaches. 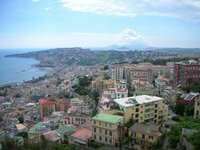 Due to strict construction laws, Naples has also been able to avoid the seaside condo clustering that is so common in popular seaside locations. The historic centre of Naples has earned itself a place on the UNESCO World Heritage List. Naples is one of those places that visitors tend to love or loathe. The city is packed and noisy. Like the rest of southern Italy, it is much poorer than the north, and the poverty is evident. The local Mafia, the Camorra, monopolise garbage collection here (and much else, including the agricultural markets), and as a result the city has a continuing garbage crisis that has to be seen to be believed. Crossing the road is a dangerous sport. To some, to quote the punning title of a recent Italian best-seller, it is Gomorrah. And yet Naples is like a concentrated Italy. The food and drink are fantastic. The climate is fantastic. It's much cheaper than the north. Regardless of their occupations, the people are all thespians - everything is usually wonderful or terrible - and they are also fatalistic, and believe in living life by the day. The city has a long history - Naples was centuries old when the Romans arrived - and much of it is on show. It has the best-preserved ancient ruins in Europe, in Pompeii and Herculaneum, one of the best museums in Italy, a great gallery, a Bourbon palace and an opera house. Pompeii is a Roman city that was buried in ash by an eruption of Mount Vesuvius in 79 AD. Pompeii is one of the greatest archeological finds ever, and boasts a complete Roman Amphitheater plus two regular theaters. The city gives an unusual glimpse into the everyday lives of Romans an the erie poses of the citizens last moments before they were buried to death. Herculaneum was the port town of Pompeii and was buried by mud in the same eruption of Mount Vesuvius in 79 AD. Because it was buried in 12 metres (40 feet) of mud, the city was better preserved than Pompeii. At the entrances to the docks archeologists found over 50 skeletons, with valuable jewellery, trying to fight their way onto the boats. Mount Vesuvius is a volcano that earned its place in the history books in 79 AD, when an eruption covered the town of Pompeii under a layer of lava. It also caused huge destruction to the town of Hercalaneum. The stratovolcano, considered one of the most dangerous in its class, could do a lot of harm to the city of Naples. The last eruption of the mountain was in 1944. Today, the volcano and its slopes are a national park. There are a number of paths leading up the mountain and there is even parking space at 200 metres below the summit. The rest of the climb has to be done by foot. Napels has a typical Mediterranean climate with generally warm sunny and dry summers and mild but wet winters. Summermonths are from June to September when average daytime temperatures are between 26 °C and 29 °C, though occasionally hitting 36 °C or 37 °C. Nights average a pleasant 18 °C. Wintermonths last from December to February with daytime temperatures between 12 °C and 14 °C and nights around 5 °C. Most of the precipitation falls between October and February with a peak in November and December. June to August only have a couple of days with some showers, while in winter there is some rain almost every other day. Snow is rare, so is frost, though -4 °C has been measured in the months of December to March at night. Naples International Airport (NAP) is the main airport for the Naples area and has 2 terminals. Terminal 1 is the main terminal for travellers and is operated by a British Airport Company. Almost all major cities in Italy are served while many major European cities also have direct service from Naples Airport. Bus - Buy a ticket for €1 at the magazine kiosk inside the airport. Go outside airport and find the bus stop for the 3S bus. Take the 3S bus into Naples' centre.The bus connects the airport to Piazza Garibaldi and Piazza Municipio. The airport is also connected to Avellino, Benevento, Caserta, Sorrento, Salerno and Serre. Airport bus - Take the tourist airport bus outside the airport. Taxi - Taxis can be dangerous to take, especially at night. If you want to take a taxi, ask the taxi driver what it will cost before you get in. Car - The airport is easily accessible from Naples by taking the exit of the so called "Tangenziale", an urban highway (A56) connecting the city of Naples to the larger metropolitan area and highways to Rome (A1), Salerno (A3) and Bari (A16). The main station is Piazza Garibaldi Station. Piazza Garibaldi is not a place to linger, especially if you are carrying bags.Another station is the Napoli Campi Flegrei. Naples is connected to Rome by a high-speed railway with trains running at almost 300 km/hour. Naples is well connected in regards to major motorways, known in Italy as autostrada. From Naples all the way north to Milan is the A1 known as autostrada del Sole (motorway of the sun), the longest transalpine motorway on the peninsula. There are other motorways from Naples too, such as the A3 which goes southwards to Salerno where the motorway to Reggio Calabria begins, as well as the A16 which goes across east to Canosa. The latter is called the autostrada dei Due Mari (motorway of the Two Seas) because it connects the Tyrrhenian Sea to the Adriatic Sea. DiMaio Lines between Napels and Cagliari, Palau and Olbia. Tirrenia Ferries between Napels and Cagliari. SNAV Ferries between Napels and Palermo. TTT Lines between Napels and Catania. Tirrenia Ferries between Napels and Palermo. Ustica Lines between Napels and Ustica Island. SNAV Ferries between Napels and Eolian Islands (Stromboli, Panarea, Lipari, Vulcano, Alicudi, Filicudi, Salina). Traghetti Siremar between Milazzo (Sicily) to Eolian Islands (Stromboli, Panarea, Lipari, Vulcano, Alicudi, Filicudi, Salina) and Naples. Don't even think about driving any vehicle smaller than a tank in Naples. Although exagerated, this is not a joke. Naples is famous even in Italy for its crazy driving. Not a single vehicle in the city is undented. One way streets aren't one way, lights are ignored, pavements are widely used to drive on, especially by mopeds. Unless you have been trained for it since childhood, there's no point in trying. You can buy Unico Campania tickets for public transport in the city and its regions. Tickets are sold by journey, by day or by longer periods. These are sold at some stations, tobacconists etc. The shortest ticket costs a euro and allows you to travel for up to an hour. There are many public transport services, including trams, buses, funiculars and trolleybuses. Buses are not bad if you can find one and get on one; they are not very frequent. They are the best way to get to Capodimonte. The central bus station is outside Piazza Garibaldi station. Naples is hilly. The best way to get to and from the district of Vomero is by funicular railway. It's worth the journey for the views alone. The Naples Metro has a few options. There are currently two underground lines. They are not very useful if you are based in the centre. More are being built. Suburban rail services are provided by Trenitalia, Circumvesuviana, Ferrovia Cumana and Metronapoli. The best way to get to the ancient sites of Pompeii, Herculaneum and Oplontis is by railway, the Circumvesuviana: http://www.vesuviana.it/. There is more than one line but trains to Sorrento always go the right way. Get off at Pompei Scavi for Pompeii, Ercolano for Herculaneum and Torre Annunziata for Oplontis. Otherwise, SITA runs buses to/from Naples and the price is comparable to that of the train. Since vehicles, and mopeds in particular, use pavements to drive on, you need to have your wits about you. You also take your life into your hands whenever you cross a road. The key to this is to approach it as if you were driving: signal your intentions and act predictably. Whatever you do, don't stop. That said, the historical centre of Naples really has to be seen on foot. Three public elevators are active within the bridge of Chiaia, in via Acton and nearby the Sanità Bridge. See comments on driving above. Naples is a gastronomic delight. It is extremely hard to get anything but a good meal, wherever you go, from the meanest café to the poshest restaurant. Neapolitan cooking tends towards the simple: when the ingredients you have to play with are of celestial quality, there's little point in doing much to them. The tomatoes around Naples may be the best in the world, so spaghetti al pomodoro doesn't need anything else. Good mozzarella is made nearby (although it may be full of dioxins, as a result of one of the region's many garbage scandals); so the simplest Neapolitan pizza is just tomato and mozzarella. Naples is the home of pizza, and don't let a Roman or an American tell you otherwise. Napolitanos are serious about it, and its quality is regulated. To get a 'DOC' (Denominazione di Origine Controllata) label, a pizza must be absolutely fresh, must be made from directly-sourced products, made from a certain kind of dough, must be cooked in a wood-fired oven at a very high temperature, etc. These are worth travelling a long way to experience. While pizzas come in all varieties, there are only two real classics: Marinara and Margherita. The Neapolitans are serious about their coffee, and this may be why the coffee in Naples has a claim to be the best in Italy. While anyone can stuff some ground coffee into a coffee machine and make an espresso, only an artist decides how finely to grind the coffee beans according to the atmospheric conditions and the time of day. But that's what a decent Neapolitan barista will do. A tip: order a cappuccino with a croissant (cornetto) for breakfast, but make it your last of the day. After that, drink espresso, or, if you must have milk, an espresso macchiato (with a blob of foam on the top). And drink it quickly.To a Neapolitan, and indeed to an Italian, drinking cappuccino all day is a tad barbaric. The lemon liqueur known as limoncello is associated with Campania, the region in which Naples lies. Much of it is made down the coast in Sorrento, or in the Bay of Naples on Capri. It is not a complicated drink, and is made with sugar, alcohol and lemon zest. But it is (dangerously) lovely, and that is presumably because the lemons in Campania, and in Sicily for that matter, are plump and relatively sweet. There are variants on the limoncello theme, but they are less common. Fragolino is a strawberry liqueur. Rucolino is made from rocket (rucola) and is not wholly to this reviewer's taste. One convenient place to pick up all these liqueurs is Limonè, next door to Napoli Sotterranea, just off Piazza San Gaetano and via Tribunali, in the heart of Spaccanapoli. They make the liqueurs themselves. Almost all towns and cities in Italy have internet cafes. A growing number of budget hostels and nicer hotels have free Wifi. By law all public-access internet points must keep records of web sites viewed by customers, and even the customer's ID: expect to be refused access if you don't provide identification. Hotels providing Internet access are not required to record IDs if the connection is provided in the guest's room, although if the connection is offered in the main public hall then IDs are required. Publicly available wireless access without user identification is illegal, so open Wi-Fi hotspots (like the ones you might expect to find in a mall or cafée) all have some form of (generally one-time) registration. The main networks are TIM (Telecom Italia Mobile, part of Telecom Italia, formerly state controlled), Vodafone, Wind, and 3 (only UMTS cellphones). Best advice is to buy a prepaid SIM card (from € 10 upwards) and a cheap mobile phone (€ 19 upwards) to put it in (if you don't have a cellphone already that you can use). It will be much more practical. All land line numbers start with 0. Mobile numbers start with 3. Numbers starting with 89 are high-fee services. In case of emergency call the appropriate number from the list below. Such calls are usually free and calls to 112, 113 (police), 115 (fire), 118 (health) can be made from payphones for free without the need of inserting coins. 112 (standard emergency number in GSM specification) can be dialed in any case for free from any mobile phone. Post Italiane is the national postal services of Italy and has quite an efficient network of postal offices and reliable postal services. Standard letters and postcards (up to 20 grams) cost €0.39 to send within Europe and the Mediterranean countries outside Europe and €0.41 to all other destinations throughout the country. Up to 50 grams, prices start at €0.52 for Europe, €0.62 for other areas. Packages start at €1.55 within Europe, and around €2.50 for other countries. Post office business hours in Italy are from 8:30am to 2:00pm from Monday to Friday, with closing times at Saturday and the last day of the month at 12 noon. In general, larger post offices in bigger cities and in tourist areas keep longer hours than those in local towns. Also note that business hours in the south might be different than the north, with longer hours at night, especially in summer! If you want to send packages you might try faster and more reliable/efficient private courier companies like TNT, UPS or DHL. We have a comprehensive list of accommodation in Naples searchable right here on Travellerspoint. You can use our map to quickly compare budget, mid-range or top of the range accommodation in Naples and areas nearby. This is version 48. Last edited at 3:01 on Aug 2, 17 by sleepBot. 49 articles link to this page.